Some people say that Miyabe Miyuki is the Stephen King of Japan. I’m not sure exactly what that means, but I think it has something to do with the fact that she has published a hell of a lot of books (as well as scripts for radio dramas, manga, and video games). Her work is superlatively popular, and a great deal of it is dark or fantastic. She is perhaps best known in America for her murder mystery novels, which more often than not feature a killer who uses a magical or semi-magical power as his or her modus operandi. The killer in The Devil’s Whisper is a hypnotist, as the book’s title implies. (I think I may have just given away what one of the blurbs on the back cover calls “a brilliant plot twist,” but I found it fairly obvious from the beginning of the novel.) He has hypnotized a young woman to run out in front of a taxi, thus making her death seem like a suicide. So far, so good. The driver of the taxi, however, is charged with vehicular manslaughter and imprisoned. His sixteen-year-old nephew, Mamoru, senses something fishy about the police reports and decides to investigate the matter himself. Mamoru is basically a decent kid, but he’s got some skeletons in his closet that come out to haunt him as the story progresses. The novel therefore presents two mysteries to the reader: what grudge does the hypnotist killer have against the women he murders, and why did Mamoru’s father abandon him and his mother when he was a young child? The way that these two plotlines come together at the end of the book is quite interesting and enjoyable. Although The Devil’s Whisper does not suffer from an abundance of characterization, almost everyone comes off as sympathetic. Mamoru does indeed bear traces of several Stephen King characters like Danny from The Shining and Jack from The Talisman, who are bright and earnest boys placed in difficult situations. The killer comes off as a kind of Hannibal Lecter figure, as logical and urbane as he is insane. The real villains of the novel actually seem to be the young women who are being killed, although the reader is forced to wonder whether they really deserved to die. In my eyes, the major weakness of Miyabe’s style is that she tells her reader what every character is thinking. This doesn’t necessarily have to be a flaw, but Miyabe will occasionally write entire sequences of paragraphs explaining the obvious. One of the first pieces of advice given to aspiring writers is to show, not tell. A relative clause depicting a character picking at her fingernail can say much more about her state of mind than an entire paragraph attempting to chart what is going on inside of her head. Since The Devil’s Whisper is only about 250 pages long, this type of inner explication is by necessity kept to a minimum, and a great deal of it is expressed in dialog, which partially reduces the level of tedium and keeps the action moving. Miyabe’s characters are interesting; but, unfortunately, none of them are so interesting that I want to know every thought that passes through their minds. Overall, Miyabe’s mystery novels range from excellent (All She Was Worth) to decent (Shadow Family) to so horrible that they make me want to claw my eyes out (Crossfire). 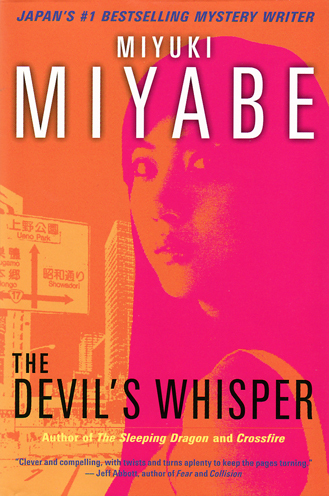 The Devil’s Whisper falls somewhere in the middle, and I would recommend it over many of Miyabe’s other titles available in translation.